126 photos in database by this submitter. 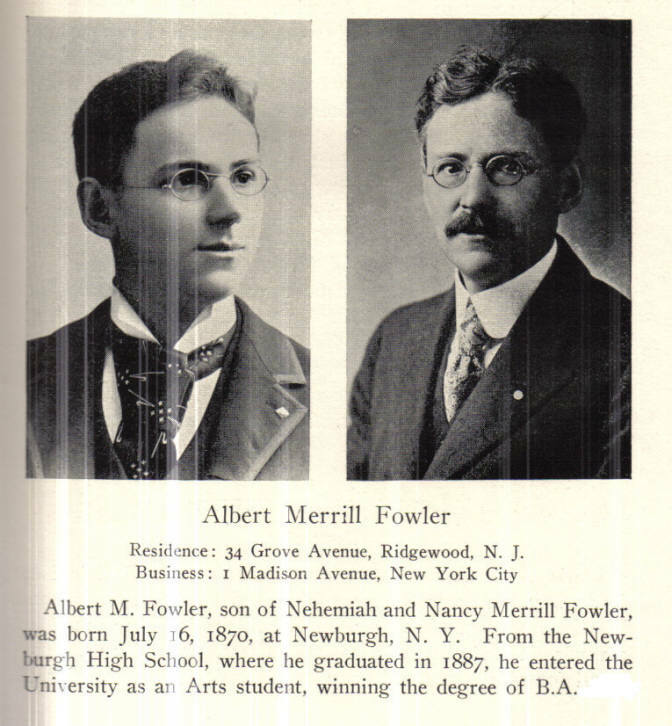 Comments: Albert Merrill Fowler (Nee: ) | Ridgewood NJ USA | 1851-1900 | Comments: Married Florine Newton Hunt Aug 1 1906 Pamplin , Va . ///This is the 33rd Year Reunion Yearbook of the Class of 1892 Cornell University Ithaca, NY. To see all the records posted click below. The Archive does not have any information beyond what is mentioned in the record. Only photo entries of the yearbook have been posted. If you would like to leave a Note in this record contact webmaster@deadfred.com place in the subject line "1892 Cornell - Note"